In many ways the work of a Jukebox reviewer is easy. There are a great many tracks that capture our minds and whisk us away to a place we’ve been to and enjoyed in the parks simply by playing a loop that lasts for an hour or so. This track of area music, however, is quite dissimilar to the music tracks for a great many other areas around the Disney theme parks. Brought to the Jukebox on May 24, 2017, the music is from a small sub-section of the Toon Studio area of Walt Disney Studios Park at Disneyland Paris that opened on July 10, 2014. Disney Imagineering is known for using the theme parks to create an escape for guests from the world around them. 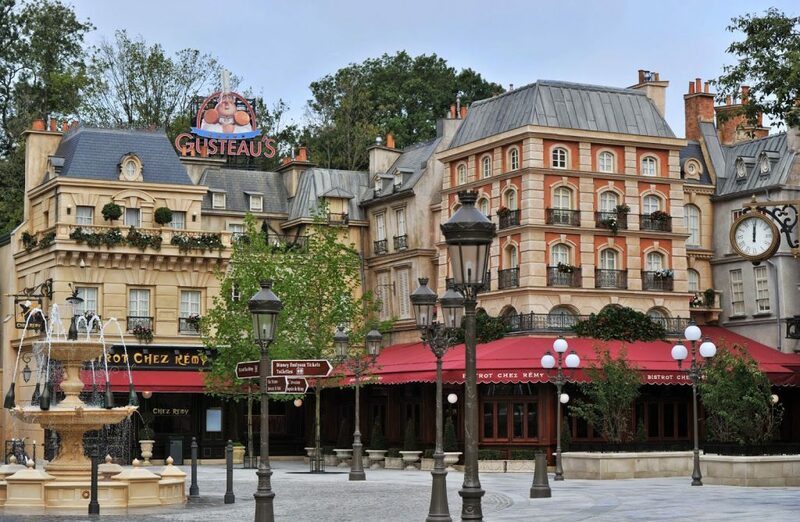 Interestingly, since La Place de Remy is based upon the Disney-Pixar film, “Ratatouille” (2007), it is one part of Disneyland Paris that is actually based on Paris! Yet my research has shown me that guests are no less impressed with what this area brings to the park. In fact, it makes many feel like they have left Walt Disney Studios Park entirely! The attention to many details in the architecture, lighting, and even the walkways show off Disney Imagineering’s greatest work. Beyond the façade guests can find L’Aventure Totalement Toquée de Rémy – a ride where guests get in a rat-shaped car and venture over Paris rooftops and through Gusteau’s kitchen. Now you can’t have a place like this without having a restaurant of course! So there is Bistrot Chez Rémy – a fine French restaurant taken right from the movie! And yes, there is ratatouille on the menu. Naturally, like all Disney themed lands, there is music, and that is what we’re about here on D-COT. Most of our area music is good for mentally transporting us to our favorite places in the parks over the course of an hour. But this track, using the classical score from the film, manages to surprise me every time and take me to a place I’ve never been, but want to go, in just over two minutes! I believe I’m not the only one as this track has a play count of 1,015. D-COT Supporters have added it to 54 custom playlists and a 617 of our members find it appetizing enough to call it a Favorite! Rivaling the Gusteau’s that once was, this track gets 4.9/5 stars on average across 30 votes. So, like many of you, until we can find a longer version of this for our Jukebox, I will continue to return to this track hungry for more! It looks beautiful! I would love to see it in person! Also, I love the way you phrase things in your articles to relate it back to the track you’re reviewing!